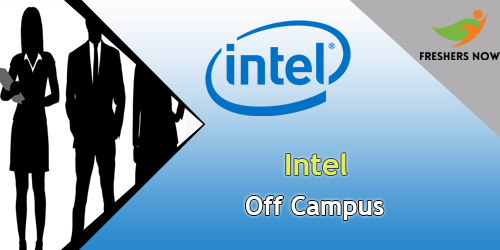 Intel Off Campus 2019 Drive for Freshers: Now, Intel recruiters are offering a golden opportunity to all 2020, 2019 and 2018 passed Outs. So, candidates who are looking for Job opportunities in IT Industry can easily utilize the latest chance. Our website provides you the entire details regarding Intel Recruitment Process and Intel Job Openings. Furthermore, the candidates who are interested to appear in the Intel Off Campus 2019 can apply for an off-campus drive either through official website @ www.intel.com or through our website freshersnow.com. Intel Job Openings and Intel Off Campus 2019 is now creating enthusiasm in all the who were waiting for the recruitment in an IT Industry. Therefore, online applicants can now apply for the Intel Off Campus 2019 to fill the vacant posts in various. An individual can obtain each and every detail about Intel Off Campus Drive 2019 from this article. Therefore, you can now get the information about the drive details, eligibility criteria, marks criteria, backlog criteria, salary details, required skills, selection process, and registration process. Therefore, we suggest you read the Intel Off-Campus drive details. And, any Graduates and Postgraduates are eligible for this interview. There is also a chance for 2019 and 2020 candidates. Furthermore, the job is an entry-level engineer, and it is off-campus recruitment and held all over across India. The competition might be tough. Hence, the candidates are requested to prepare well for the interview in order to grab the job. For most of the Intel Off Campus 2019, the aspirants have to apply for it through the original website and download it. When it comes to freshers we provide you the registration link and the process at the bottom of the article. Intel Corporation is an American multinational corporation and technology company headquartered in Santa Clara, California, in Silicon Valley. It is the world’s second largest and second highest valued semiconductor chip makers based on revenue after being overtaken by Samsung and is the inventor of the x86 series of microprocessors, the processors found in most personal computers (PCs). Intel supplies processors for computer system manufacturers such as Apple, Lenovo, HP, and Dell. Intel also manufactures motherboard chipsets, network interface controllers and integrated circuits, flash memory, graphics chips, embedded processors and other devices related to communications and computing. Client Computing Group – 55% of 2016 revenues – produces hardware components used in desktop and notebook computers. Data Center Group – 29% of 2016 revenues – produces hardware components used in server, network, and storage platforms. Internet of Things Group – 5% of 2016 revenues – offers platforms designed for retail, transportation, industrial, buildings, and home use. Non-Volatile Memory Solutions Group – 4% of 2016 revenues – manufactures NAND flash memory and 3D XPoint, branded as Optane, products primarily used in solid-state drives. Intel Security Group – 4% of 2016 revenues – produces software, particularly security, and antivirus software. Programmable Solutions Group – 3% of 2016 revenues – manufactures programmable semiconductors (primarily FPGAs). Therefore, to be considered for a position at Intel, you must submit your resume/C.V. electronically using our web-based tools. Need help? their applicant tool provides you with key explanations and instructions right on each page so you can more accurately and effectively create your profile or search for and apply for jobs. Moreover, you will be asked several prescreening questions to better match your skills and experience to open positions. Furthermore, if you are applying for a specific job, the questions asked will be relevant to that position. Otherwise, the questions will be more general in nature. Upon completion of your profile and clicking “Submit”, the tool displays a message acknowledging receipt of your profile. You will also receive an e-mail confirming receipt of your information. Therefore, if you are willing to join Intel, you can now apply for Intel Off Campus 2019 through the registration link given below. Moreover, to apply for Intel Off-Campus you have to meet the eligibility criteria given below. Hence, any Graduates and Postgraduates who have mathematics as their academic subject are eligible. The gap between academic careers should not be more than 1 year. Minimum of 60% in an Academic career. Hence, no backlogs are allowed. In the case of, backlogs students are not eligible to apply for this job. Therefore, we suggest the contenders clear their backlogs during their academic career. Must have basic knowledge about the academic subjects. Candidates should have an excellent academic record. Their age limit should be 18 to 35 years. They must be good at Communications skills. They should be able to work rotational shifts. Good soft-skills for being able to work in a multi-site development and in a multicultural environment. Aspirants must have a hard-working nature. Original ID Proof (Adhaard card/PAN card/Ration card etc). Candidates who are applying for the Intel Off Campus 2019, they can easily apply by following the given steps. Next, submit your first name and last name. You have to upload the currently updated resume. Find your career by applying for Intel Off Campus 2019 Drive for Freshers | Online Registration. For more updates keep browsing our website.